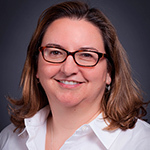 Leslie Stephens has responsibility for global market access and reimbursement strategy and initiatives for the coronary and endovascular business at Abbott Vascular. In this role she has responsibility for ensuring patient access and payment for our bioresorbable vascular scaffold (BVS), drug eluting stent (DES), and endovascular products. Previously Leslie served as director, Global Marketing, DES and BVS with Abbott Vascular. Leslie joined Guidant Corporation’s Vascular Intervention business unit in 2000 as Global Product manager, Atherectomy, and was named to positions of increasing responsibility, including senior analyst, Market Intelligence; group manager, Marketing Communications; group manager, Global Metallic Stents; and director, Global Core Products. Her initial business experience included program management, scientist and associate scientist roles for SmithKline Diagnostics in Palo Alto, Calif., and a research and development role at ChemTrak in Sunnyvale, Calif.